That big gorilla from Rampage the video game is back in the Bronx, punching out the windows of tall skyscrapers and terrorizing the town again. Aaron Judge had himself a night boys and girls. 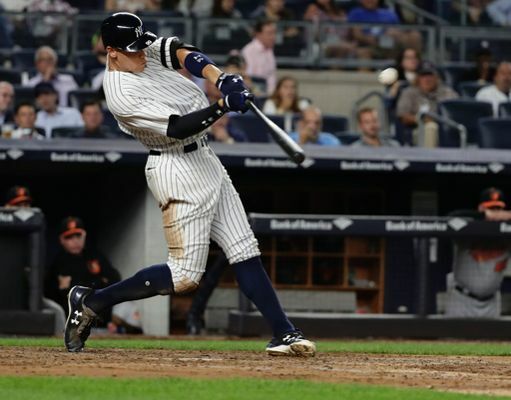 The Yankees bludgeoned the Orioles 13-5, Gary Sanchez also homered for the 31st time and became the first Yankee catcher to ever hit more than 30 homers. Judge has obviously adjusted and he’s back to being the terrorizing hitter that he was in the first half of the season. He’s here to stay. He drove in six runs on the night, and I continue to tell everyone alive that I think the Yankees can give those invincible Cleveland Indians some fits if they escape the Wildcard Game in the American League. Today, it would be the Yankees hosting the Twins in a fun little one-game tilt in New York. Aaron Judge is great for baseball. Even with Giancarlo Stanton doing what he does – I don’t think there’s a more fun power hitter in our recent generation than this kid. He’s got about two weeks left to hit six more and chase down Mark McGwire’s 1987 campaign.